1. Does anyone who want's to visit Meyerton RC Raceway have to pay to do so? No, only if you are actually going to use your RC Car on one of our tracks. Spectators don't have to pay. 2. How much does it cost to ride my RC Car at Meyerton RC Raceway? For day visitors it is R50-00 for the whole day and you can use the on-road and or off-road track. 3. Must I belong to the club in order to race my RC Car? No, the track is open for anyone who loves riding their RC Cars. 4. Do you have an age restriction for riding on the track? No, as long as the younger drivers have adult supervision. 5. Do you have refreshments and snacks available to purchase at Meyerton RC Raceway? 6. Can I ride my RC Car on a race day even though I have not entered for the race? No, only race entries are allowed on a specific track for that race. 7. Do I need to be a club member to participate in a race? No, anyone who loves a bit of competition can take part in a race, as long as you at least have moderate driving skills or, if you want to enter for a beginners class. 8. Do you enforce rules at the track? Yes, there are rules in place for everyone's own safety. Click here for more information. 9. On what days of the week are you open? 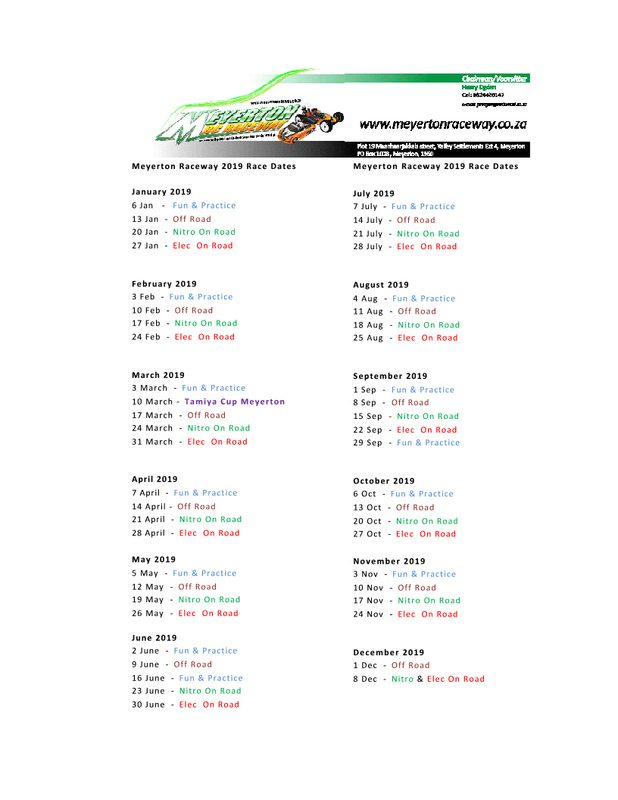 Meyerton RC Raceway is only open on Sundays. Sometimes we might open the race tracks on a public holiday but, then we will post a notification on the website. 10. How do we get to Meyerton RC Raceway? Click here to see the directions and map to the track. 11. I can't register for a race using one of the On-Line Registration forms on the site, what should I do? If you have Internet Explorer installed on your PC, that might be the problem. Try downloading and installing Mozilla Firefox for free and use it for browsing the internet instead of Internet Explorer. 12. Does Meyerton RC Raceway sell RC Car products? 13. Does Meyerton RC Raceway support ORE (On-Road Electric) racing? Yes, all types of RC Cars are welcome. 14. What are the most popular RC cars being used at Meyerton RC Raceway? They vary from 1:10 Nitro and Electric right up to 1:8 Pan Cars including 1:8 GT Cars. 15. Can I use a Personal Transponder on my car? 16. What Radio Frequencies can I use? Any frequency, as long as the Frequency List rules are obeyed.